Background: For assessing the effects of interventions on exercise tolerance, the tolerable duration (tlimit) of a high-intensity constant-speed endurance test is recommended. The test intensity is determined by the test speed (stest) which should be individualized to target a tlimit of 3 to 15 minutes. We determined the accuracy of setting the stest to achieve a targeted tlimit of 3 to 15 minutes using the participant’s easily measured and non-fatiguing usual (susual) and fast (sfast) walk speeds. Methods: Participants with COPD were asked to walk at their usual and fast walk speeds to establish their susual and sfast. This required that they walk for less than 1 minute. The individualized stest was calculated from a previously developed equation (0.57 x [sfast – susual]) + susual. Participants then completed a constant-speed endurance test, walking at this calculated stest to intolerance, to determine if the resultant tlimit occurred within 3 to 15 minutes. Results: Twenty-nine participants (forced expiratory volume in 1 second [FEV1] standard deviation [SD ]=43  %predicted; FEV1 to forced vital capacity [FVC]ratio= 41 %; susual = 57.3 [10.4] meters per minute (m·min-1 ); sfast = 71.7 [10.7] m·min-1) completed the study. During testing, 24 (83%) participants used supplemental oxygen and 16 (55%) used a walking aid. The derived stest was 65.6 [10.3] m·min-1 with the observed tlimit of 6.0 [5.0] minute. Twenty-four of 29 (83 %) endurance tests were within 3 to 15 minutes. Conclusion: Using the usual and fast walk speeds provides a simple, quick, inexpensive method for clinicians to set an acceptable endurance walk speed. Funding Support: This study was supported, in part, by West Park Healthcare Centre Foundation. Dr. Goldstein is supported by the National Sanitarium Association-University of Toronto, Chair in Respiratory Rehabilitation Research. Dr. Evans is supported by a National Institute for Health Research Clinical Lectureship (Respiratory). Dr. Rozenberg is supported by the University of Toronto, Clinician Scientist Training program. Date of acceptance: April 16, 2014. The duration (tlimit) of a high-intensity constant-power endurance test is recommended as the test of choice when evaluating the effects of an intervention on exercise tolerance, both in the clinical and research settings, because of its ability to assess treatment responsiveness.1-4 The metabolic stressor of constant mechanical power could be any physical activity including cycling or walking. With walking, mechanical power is derived from the participant’s walking speed as long as the individual’s weight is preserved. The walking speed of the endurance test (stest) must be specific to the patient and should be targeted to be within the individual’s high intensity domain. It has been suggested that this domain could be achieved by targeting a tlimit of 3 to 15 minutes.5,6 In a stest that is too fast, the tlimit will be less influenced by the individual’s endurance characteristics and will be tolerated only for a short duration (< 3 minutes). Even in the presence of a large interventional effect on endurance, only small changes in tlimit will be observed if the stest is too fast (an unresponsive test). During a stest that is too slow, close to the critical speed (scritical) near the exponentially rising point of the speed to endurance curve, the untreated control exercise can be continued indefinitely and will not be helpful in discriminating the effects of the treatment (an unresponsive test). Therefore, the ideal test speed will result in a tlimit of 7 minutes, below a speed that is unresponsive (resulting in tlimit > 3 minutes) but above the scritical (resulting in tlimit < 15 minutes). Conventionally, a percentage (70 to 85%) of an incremental test to intolerance is used to set the intensity of the endurance test.1,3,7-10 Practical limitations of this approach include test administration time and participant carry-over fatigue. For example, it may take an extra hour to administer 1 incremental test on the day before, to avoid carry-over effects, before having the individual return to complete the endurance tests used to assess the effects of the intervention. The alternative of basing the test speed of a high-intensity constant-speed endurance test upon the 6-minute walk test (6MWT) is limited by the inconsistency of the 6MWT intensity.11,12 From previous research, we observed a simpler alternative to setting the stest by using the usual (susual) and fast (sfast) walking speeds.12 This approach requires the individual to walk for less than 1 minute (< 30 seconds at their usual speed and < 30 seconds at their fast speed). Usual walk speed is determined by simply asking an individual to walk, for a relatively short distance and without encouragement, at their usual speed. It is a brief, valid, sensitive non-fatiguing measure often included in clinical research studies.13,14 During this test, individuals are also requested to demonstrate their fast walk speed,15-17 which reflects their potential to respond to increased demands. The susual and sfast mark the lower, scritical, and upper boundaries of an individual’s unsustainable (high intensity) walk domain.12 In a pilot study,18 we determined that in patients with chronic lung disease a large proportion of endurance walk speeds were within speeds bounded by the susual and sfast. Moreover, an equation derived from the speed to endurance time relationship 12 that incorporated the patients’ susual and sfast could identifyacceptable walk tests (tlimit of 3 to 15 minutes). Although the susual and sfast are easy to measure and are well tolerated, the utilization of these walk tests for setting the endurance walk speed has not been prospectively evaluated. Thus, the objective of the present study was to prospectively evaluate, in a cohort of patients with COPD, the accuracy of achieving an acceptable tlimit of 3 to 15 minutes using the stest calculated from the individual’s demonstrated susual and sfast. After approval by the joint Bridgepoint/West Park/Toronto Central Community Care Access Centre/Toronto Grace Health Centre Research Ethics Board, #2012-26, stable patients with moderate to severe COPD,19 including those who required supplemental oxygen or a wheeled-ambulatory aid for walking (also known as a wheeled-walker or rollator), were recruited. Exclusion criteria included unstable cardiovascular disease, an acute respiratory exacerbation within 4 weeks or a predominant orthopaedic or neurologic limitation to walking. Study participants gave informed consent before study participation. Demographic characteristics (age, gender, and body mass index), spirometry, Medical Research Council (MRC) Dyspnea scale and the most recent 6MWT distance (6MWTdist), within 6 months, were obtained from the participants’ medical records. Supplemental oxygen and the use of a wheeled walker were recorded at the time of testing. 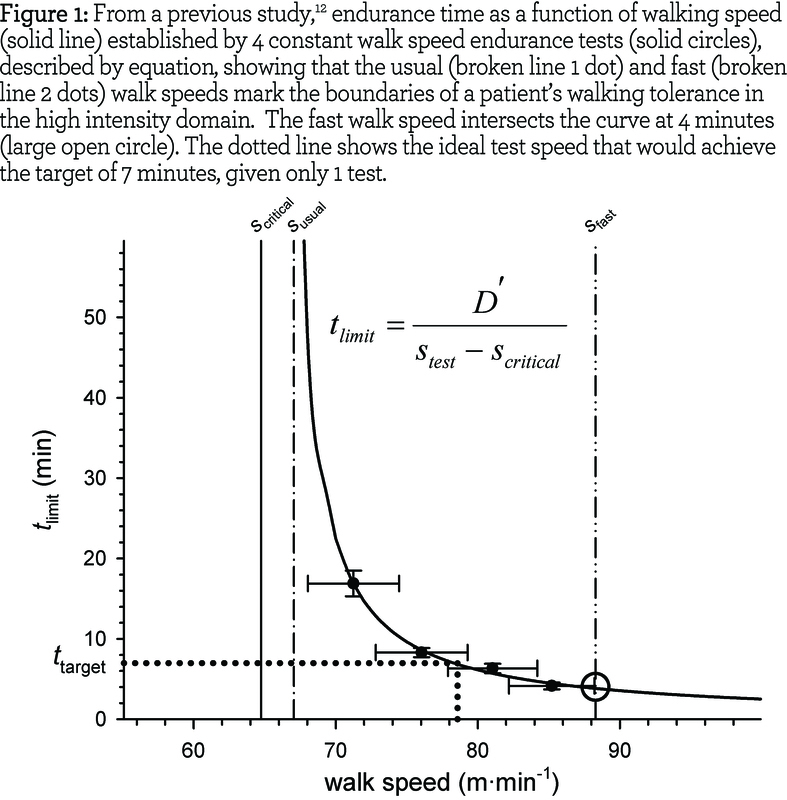 In previous work,12 we observed that the susual approximated the sustainable walk speed (scritical) and that the sfast, on average, could be endured for 4 minutes (the point at which the sfast intersected the speed to endurance time curve; see Figure 1). In a pilot study,18 summarized in the Online Data Supplement, we observed that the majority of clinical endurance walk test results fell within speeds bounded by the susual and sfast and, using these results, we derived equation 1 that could predict the measured tlimit. The current study was designed to prospectively determine the proportion of high-intensity, constant-speed endurance tests that would result in a tlimit between 3 and 15 minutes when the stest was set using the algebraic equivalent of equation 1. In equation 2, tpredicted was replaced with the ideal endurance time (ttarget) of 7 minutes, a point that was well balanced on the hyperbolic speed to endurance time curve (Figure 1) and hypothesized as an ideal endurance time for a pre- intervention test ensuring responsiveness to an intervention. First, a participant’s susual and sfast was determined. To measure susual and sfast, the participant walked unaccompanied on a level, enclosed, temperature-controlled corridor. Each participant was instructed to “walk at your usual pace until you reach the far pylon and return at a speed you consider to be fast.” Usual and fast speeds were measured over the middle 10 meters of each walk. The procedure was repeated after a 5 minute rest and the average of susual and sfast was calculated. Second, after another 5 minute rest, participants completed a constant-speed endurance walk test. For the endurance test, stest was calculated using equation 2 and the measured averages of the susual and sfast. The participant followed a test administrator, who walked straight back and forth along a 30 meter floor marked at 5 meter intervals. Walking was at a pre-selected speed guided by an audio signal with beeps, coinciding with each marker, to set the speed.12 For example, a pre-selected test speed of 60 meter per minute (m <b">.min-1)required a frequency of 12 beeps per minute. The test did not control the stride or cadence and the participant focused only on following the administrator. 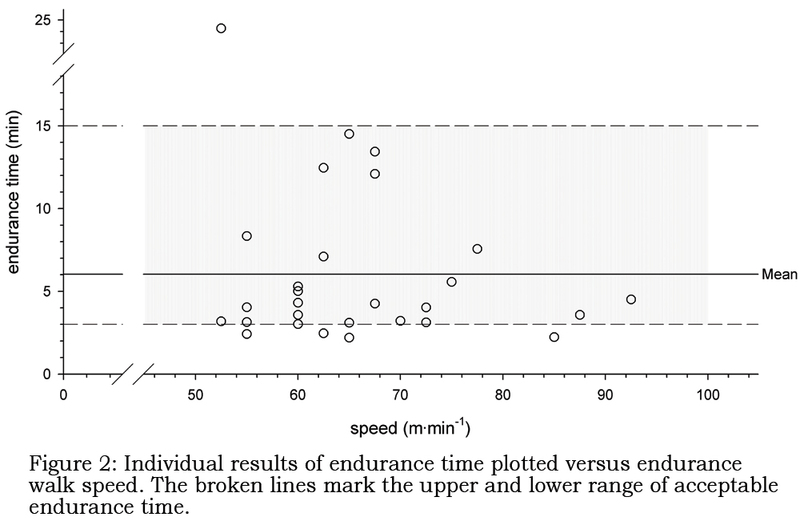 Endurance time (tlimit) occurred when the participant, despite encouragement, could not maintain their stest. We used SAS® software (SAS Institute v9.3) for statistical analysis. Mean values for each variable were calculated and expressed as mean [standard deviation (SD)] or mean [95% confidence intervals] unless stated otherwise. The sample size was set prospectively based on the number of participants required to determine the repeatability of susual and sfast with acceptable precision.20 We used a paired t-test to determine if there was a significant difference between the measured endurance time (tlimit) and the targeted endurance time (ttarget). We calculated the proportion of tests that resulted in a tlimit between 3 and 15 minutes when the stest was set using equation 2. Of the 48 patients screened, 36 (75%) were eligible and 29 (81%) completed the study. Twelve candidates were not eligible because they did not have a clear diagnosis of COPD,5 had a recent exacerbation3 or had an orthopaedic condition that limited their walking.4 Of the eligible candidates, 3 declined to participate and 4 were withdrawn because of the occurrence of an acute exacerbation after giving their consent to participate. The characteristics of the moderately to severe COPD participants (FEV1 [SD] = 43  %predicted; FEV1/FVC = 41  %) are described in Table 1. Sixteen participants (55%) used supplemental oxygen during walking and 24 (83%) used a rollator. Fifteen of 16 participants transported their oxygen cylinder in their rollator whereas 1 participant pulled a cart carrying their oxygen cylinder. The walk speeds, including the stest (65.6 [10.3] m·min-1) and endurance test results (tlimit = 6.0 [5.0] min), are reported in Table 2. -3.89 to 0.33] minutes; p=0.10). Twenty-four (83 [69 to 97] %) of the 29 endurance tests were within 3 to 15 minutes (Figure 2). We describe an easy, quick method for establishing a walking speed that can be tolerated for 3 to 15 minutes and then demonstrated, prospectively, that a constant-speed endurance walk test speed (stest), calculated from a 7 minute target and the individual’s susual and sfast, will reliably achieve a test result (tlimit) of 3 to 15 minutes. The observations described are applicable to patients with moderate to severe COPD, typical of those enrolled in pulmonary rehabilitation or those referred for an oxygen assessment in which exercise tolerance is an important outcome of functional improvement. This approach requires only 1 minute of walking before the endurance test and provides a valuable alternative to a physically-demanding and time- consuming preliminary incremental test. The method tested in this study has the advantage of basing the test walk speed on 2 measured points at the extremes of an individual’s walk domain rather than using a single point to reflect the upper or lower boundary as in the incremental test or the self-paced 6MWT, respectively. The sfast indicates the upper part of the endurance domain12 and is likely close to the highest speed that would be achieved on an incremental test. The susual provides the lower boundary as it is close to the sustainable speed.11,12 Given that self-paced tests are subject to behavioral carry-over effects,23-25 the susual and sfast, being simple and non-demanding, could be repeated in the same session multiple times if required to establish stability and increase the precision of the measurement. It has been suggested that26 when using the laboratory constant power cycle endurance ergometry test, a pre-intervention control tlimit of 4 to 7 minutes is desirable and maybe achievable when testing healthy individuals.6 However, this range may not be practical in patients with COPD who have a greater heterogeneity in their walking speed to endurance relationship. In participants similar to ours undergoing a series of constant power cycle endurance tests, there was a significant deviation (2.3 minutes) from the expected tlimit and a wide range of values (3.6 to 22 minutes) even after the exclusion of 3 outliers from the analysis.6 In many instances a second test at an adjusted speed was required to achieve the desired target. The broader range of 3 to 15 minutes for the walking test may be more acceptable. The limitation of using usual and fast walking speeds to set the test speed is that a small number of patients (17%) may not achieve an endurance time of 3 to 15 minutes. This requires a second constant-speed test, using an adjusted stest, to achieve a result within the responsive range. However, this circumstance occurs less frequently with the usual and fast walk tests to set speed than when the test speed is determined from an incremental test.21, 22 In both instances a second constant power test is required. 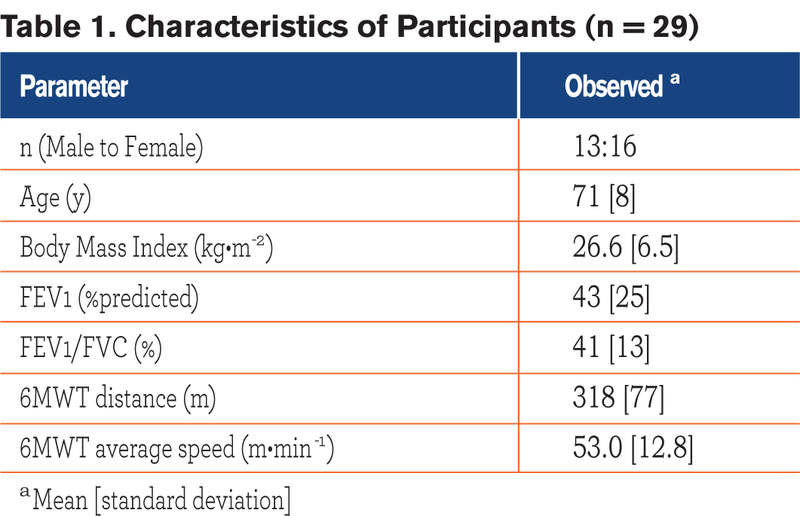 Although most participants had an endurance time within the suggested target, the results were not normally distributed and a majority (n = 20; see Figure 2) of the participants were in the lower acceptable range. The non-normal distribution observed is characteristic of a single point endurance test.6 Although endurance could be better characterized by the critical speed that describes the endurance component of the entire high intensity domain, and would be normally distributed, its determination would require performing more than one test, using different speeds, and calculating the critical speed. This is impractical in most clinical and research situations. Participants enrolled had moderate to severe COPD. In more fit patients with milder disease, their walking domain would be shifted to higher speeds with a faster susual and a greater difference between susual and sfast. Such individuals would be unlikely to be assessed for ambulatory oxygen and when exercising could tolerate more physically-demanding tests such as running, so the approach described would not be indicated. In conclusion, we describe a simple, quick and inexpensive approach using the usual and fast walking speeds to set the test speed for a high-intensity constant-speed walking test in patients with moderate to severe COPD. It is comparable in accuracy, less physically- demanding and requires less technical time than the conventional approach. This study was conducted using the facilities and resources of West Park Healthcare Centre. The authors thank the patients of West Park Healthcare Centre for their participation. No conflicts exist for any of the authors. 1.Palange P, Ward SA, Carlsen KH, et al. Recommendations on the use of exercise testing in clinical practice. Eur Respir J. 2007; 29(1):185-209. doi: http://dx.doi.org/10.1183/09031936.00046906. 3.Revill SM, Morgan MD, Singh SJ, Williams J, Hardman AE. The endurance shuttle walk: a new field test for the assessment of endurance capacity in chronic obstructive pulmonary disease. Thorax. 1999;54(3):213-222. doi: http://dx.doi.org/10.1136/thx.54.3.213. 4.O'Donnell DE, Aaron S, Bourbeau J, et al. Canadian Thoracic Society recommendations for management of chronic obstructive pulmonary disease - 2007 update. Can Respir J. 2007;14 (Suppl B):5B-32B. 5. Jones AM, Vanhatalo A, Burnley M, Morton RH, Poole DC. Critical power: Implications for determination of (V) over dotO(2max) and exercise tolerance. Med Sci Sports Exerc. 2010;42(10):1876-1890. doi: http://dx.doi.org/10.1249/MSS.0b013e3181d9cf7f. 6. van der Vaart H, Murgatroyd SR, Rossiter HB, Chen C, Casaburi R, Porszasz J. Selecting constant work rates for endurance testing in COPD: The role of the power-duration relationship. COPD. 2014;11(3):267-276. doi: http://dx.doi.org/10.3109/15412555.2013.840572. 7. Bye PT, Anderson SD, Woolcock AJ, Young IH, Alison JA. Bicycle endurance performance of patients with interstitial lung disease breathing air and oxygen. Am Rev Respir Dis. 1982;126(6):1005-1012. 8. Simpson K, Killian K, McCartney N, Stubbing D, Jones N. Randomised controlled trial of weightlifting exercise in patients with chronic airflow limitation. Thorax. 1992;47(2):70-75. doi: http://dx.doi.org/10.1136/thx.47.2.70. 9. Dolmage TE, Waddell TK, Maltais F, et al.The influence of lung volume reduction surgery on exercise in patients with COPD. Eur Respir J. 2004; 23(2): 269-274. doi: A href="http://dx.doi.org/10.1183/09031936.03.00068503" target="_blank">http://dx.doi.org/10.1183/09031936.03.00068503. 10. Cazzola M, MacNee W, Martinez FJ, et al. Outcomes for COPD pharmacological trials: from lung function to biomarkers. Eur Resp J. 2008;31(2):416-468. doi: http://dx.doi.org/10.1183/09031936.00099306. 11. Casas A, Vilaro J, Rabinovich R, Mayer A, et al. Encouraged 6-min walking test indicates maximum sustainable exercise in COPD patients. Chest. 2005;128(1):55-61. doi: http://dx.doi.org/10.1378/chest.128.1.55. 12. Dolmage TE, Evans RA, Hill K, Blouin M, Brooks D, Goldstein RS. The effect of pulmonary rehabilitation on critical walk speed in patients with COPD: A comparison with self-paced walks. Chest. 2012;141(2):413-419. doi: http://dx.doi.org/10.1378/chest.11-1059. 13. Graham JE, Ostir GV, Fisher SR, Ottenbacher KJ. Assessing walking speed in clinical research: a systematic review. J Eval Clin Pract. 2008;14(4):552-562. doi: http://dx.doi.org/10.1111/j.1365-2753.2007.00917.x. 14. Studenski S, Perera S, Patel K, et al. Gait speed and survival in older adults. JAMA. 2011;305(1):50-58. doi: http://dx.doi.org/10.1001/jama.2010.1923. 15. Bohannon RW. Comfortable and maximum walking speed of adults aged 20-79 years: Reference values and determinants. Age Ageing. 1997;26(1):15-19. doi: http://dx.doi.org/10.1093/ageing/26.1.15. 16. Himann JE, Cunningham DA, Rechnitzer PA, Paterson DH. Age-related changes in speed of walking. Med Sci Sports Exerc. 1988;20(2):161-166. doi: http://dx.doi.org/10.1249/00005768-198820020-00010. 17. Oberg T, Karsznia A, Oberg K. Basic gait parameters: reference data for normal subjects, 10-79 years of age. J Rehabil Res Dev. 1993;30(2):210-223. 18. Dolmage TE, Evans RA, Malek N, O'Brien L, Goldstein RS. Investigation of a simple method to set the walking speed for the assessment of ambulatory oxygen in patients with chronic lung disease. Am J Respir Crit Care Med. 2012;185:A4861. 19. O'Donnell DE, Aaron S, Bourbeau J, et al. Canadian Thoracic Society recommendations for management of chronic obstructive pulmonary disease--2003. Can Respir J. 2003;10 (Suppl A):11A-65A. 20. Rozenberg D, Dolmage TE, Evans RA, Goldstein RS. Repeatability of usual and fast walking speeds in patients with chronic obstructive pulmonary disease. J Cardiopulm Rehabil Prev. Published ahead of print. doi: 10.1097/HCR.0000000000000072 . 21. Brouillard C, Pepin V, Milot J, Lacasse Y, Maltais F. Endurance shuttle walking test: responsiveness to salmeterol in COPD. Eur Respir J. 2008;31(3):579-584. doi: http://dx.doi.org/10.1183/09031936.00119007. 22. Hill K, Dolmage TE, Woon L, Coutts D, Goldstein R, Brooks D. Comparing peak and submaximal cardiorespiratory responses during field walking tests with incremental cycle ergometry in COPD. Respirology. 2012;17(2):278-284. doi: http://dx.doi.org/10.1111/j.1440-1843.2011.02089.x. 23. Guyatt GH, Pugsley SO, Sullivan MJ, Thompson PJ, Berman L, Jones NL, Fallen EL, Taylor DW. Effect of encouragement on walking test performance. Thorax. 1984; 39(11):818-822. doi: http://dx.doi.org/10.1136/thx.39.11.818. 24. Evans RA, Hill K, Dolmage TE, et al. Properties of self-paced walking in chronic respiratory disease: a patient goal-oriented assessment. Chest. 2011;140(3):737-743. doi: http://dx.doi.org/10.1378/chest.10-3104. 25. Bansal V, Hill K, Dolmage TE, Brooks D, Woon LJ, Goldstein RS. Modifying track layout from straight to circular has a modest effect on the six-minute walk distance. Chest. 2008;133(5):1155-1160. doi: http://dx.doi.org/10.1378/chest.07-2823. 26. Casaburi R. Factors determining constant work rate exercise tolerance in COPD and their role in dictating the minimal clinically important difference in response to interventions. COPD. 2005;2(1):131-136. doi: http://dx.doi.org/10.1081/COPD-200050576.